I’ve been a avid wearer of Xero Shoes for a few years now. When I first discovered them, they were called Invisible Shoes, and only had two product lines: the 4 mm and 6 mm original DIY Xero Shoes. Officially they were called Connect and Contact – names which are so similar I’ve never been able to remember which is which, or remember even them at all (I just had to look them up twice to mention them here). But names aside, I’ve always loved them for their simplicity. My go-to shoes are the 4 mm version, keeping the 6 mm in reserve for rough terrain. So when Xero Shoes branched out into other sandals I was interested. I eagerly ordered the first of these – the Sensori Venture (now called the Amuri Venture – again, another odd, hard to remember name, which again I had to look up). These were basically the original Xero Shoes, but with a heel-cup added and an easy lacing system. I must say I hated these with a passion right from the start. The heal-cup was just weird, if felt weird, it looked weird… it was weird. After a couple of outings they were soon shoved in back of the cupboard, never to be worn again. I still loved my 4 mm and 6 mm Xeros though, and have acquired many pairs in different colours since. So it was with real interest I received a request from Xero Shoes UK to try out a pair of their latest shoes: the Umara Z-Trail. Yes you read that right, ‘Umara’. Very similar to ‘Amari’. Apparently I’d missed two shoes in between – the ‘Amari Cloud’ and the ‘Amari Z-Trek’. They released these following the ones I’d hated – are you keeping up with all these similar non-descriptive names? The shoes I’d missed were supposedly a more comfortable version of the Amuri (Sensori) Venture, and their first foray into trek shoes with the Umara Z-Trek. The soles where necessarily thicker and the lacing system had developed into a series of webbing straps. From pictures, they looked as if the soles were around 15 mm thick. I imagined them to be padded and wasn’t sure they’d be for me. But I figured it would be fun to test drive them regardless. The first thing I noticed were that the soles were much thinner than I’d thought. They were also quite hard, didn’t feel padded, but were still flexible enough to be able to roll up… just. I measured their thickness at 9 mm for the men’s size 45. Other initial observations were that they had a heal-cup, albeit a much reduced one from the Venture. The strapping system is nice. Although I’d got used to the cord between my toes on other Xero Shoes, I’ve never been a flip-flops wearer and would prefer not to have something between my toes. So I had high hopes for these straps; I wasn’t disappointed. Unlike most ways of lacing the original Xero Shoes, the straps on the Z-Trail allow you to set the position of the sandals to the position of your ankle. So the front strap is just keeping your foot in the shoe, and not trying to stop it riding forward, as is the case with the originals Xeros. I initially worried that the front strap would squeeze my toes together, due to its position. However trying the sandals while wearing a set of Correct Toes demonstrated that in fact the strap was doing nothing of the sort, it’s because my toes are already scrunched up from 40 years of shoe wearing – one of the reasons I’ve just bought some Correct Toes in the first place. So they were still perfectly comfortable while wearing the Correct Toes with them. I did take them on a test run. Regular readers of this site will know, I only run shoeless now. So this review mainly centres around using them as general shoes, rather than specifically for running. However I did take them out for a mile run to see how they fared. As mentioned previously, the straps around the ankle really secure the sandals well and stop them moving around. This is quite important in running sandals, and the Z-Trail do this very well. They are superbly light; weight-wise I hardly noticed them at all. My feet felt the same running in these as they do running completely shoeless, bar the planter surface sensation of course. 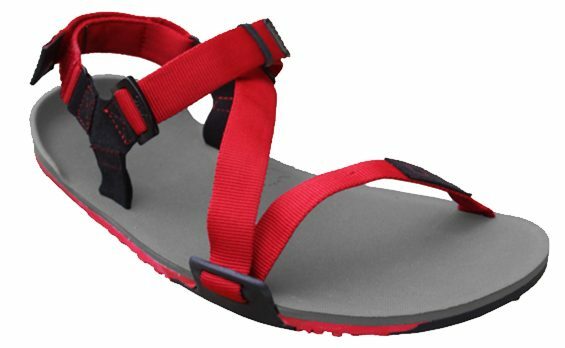 I think if you’re a minimalist shoe runner, these sandals could well become your new go-to running shoes for rough terrain. I was really impressed. I’m used to feeling the ground beneath most of my barefoot shoes, as most of them have only 4 mm soles. The construction of the sole on the Z-Trail, being more substantial, does dull most of this out. So it depends on your point of view if you consider this an advantage or not. Overall I liked them very much and they will now be my go-to shoe for rough terrain where my 6 mm Xeros don’t quite cut it. Less ground feel and flex than regular barefoot shoes. A great minimal sandal that will definitely become one of my go-to shoes. Although only for rough terrain for me, as I'm too tied to my 4 mm Xeros for general use in warm weather. Full disclosure: The shoes featured were offered for review by Xero Shoes UK. We got to keep the shoes afterwards; no payment of any kind was made.